Franklin University appears in our ranking of The Top 15 Best Affordable Online Master’s in Accounting Degree Programs. Franklin University offers finance and accounting degree programs at all levels for online students. Those who want an introduction to the world of finance can earn an Associate of Science in Accounting from the university. This program is available online and on many of its campuses. Students take 64 credits of courses that teach them the financial skills that they’ll need to work in bookkeeping and similar positions. The finance and accounting courses they take will include Federal Income Tax, Intermediate Accounting I and II, Cost Management and Government and Not for Profit Accounting. An Associate of Science in Financial Management will include courses such as Principles of Finance, Investments and Money, Banking and Financial Markets. The university now has an Associate of Science in Forensic Accounting too that serves as a good introduction to the world of financial investigations. Professors working in this program previously worked for the Internal Revenue Service and similar organizations. They can pass on their knowledge to the next generation of investigators. This program features classes that include Corporate Governance and Internal Control Assessment, Legal Elements of Fraud and Interviewing Techniques for Fraud Investigation. There are even more options available at the bachelor’s level, including a Bachelor of Science in Accounting. Students who finish this program will have the knowledge needed to enroll in a graduate program and to take the CPA exam. The university developed a curriculum that includes courses aligned with the accounting industry today. That curriculum includes 28 hours of business classes and 32 hours of accounting courses. Students will take Accounting Research and Analysis, Accounting Information Systems, Principles of Finance, Business Management and Introduction to Microeconomics. Other bachelor’s programs include the same business core but will include different major courses. Students in the risk management and insurance program learn how to manage risks and help their clients through courses such as Principles of Risk Management and Insurance, Retirement Savings and Income Planning, Insurance Company Operations and Property and Casualty Insurance. They’ll also do a capstone. Some of the required classes in the business forensics program include Fraud Examination, Business Ethics for Leaders, Legal Elements of Fraud and a Forensic Accounting Capstone. Other bachelor’s programs for finance and accounting majors include financial management, financial planning, and forensic accounting. Franklin University also offers a Master of Science in Accounting that features 30 semester hours of classes. Four credits will come from the capstone that all students do during their final years or semesters. They earn 10 credits from three required/core classes: Introduction to Research in Accounting, Financial Accounting Theory, and Management Control Processes and Systems. They will then take 16 hours of electives from one of two concentration tracks: financial operations or taxation. Franklin allows students to customize their programs with these electives. Franklin University is an institution in Ohio. Founded in 1902, it grew from a single campus associated with the YMCA in Columbus to a major educational system with campuses in multiple states. Known as the YMCA School of Commerce during its early years, it would later separate from that organization and form a college and then a university. Franklin now has campuses in Illinois, Indiana, Wisconsin, Pennsylvania, and Ohio. Most states are home to multiple campuses that are usually in downtown areas and business parks. Some of those campuses share space with commercial businesses. Though many know Franklin University for its business programs, it also offers degrees and certificates in nursing, emergency management, health sciences and other fields. The university also operates one of the largest virtual college campuses in the nation. All accounting and finance programs available at Franklin University have accreditation from the International Assembly for Collegiate Business Education (IACBE). This type of accreditation also covers the university’s undergrad and graduate business programs. The accreditation that lets students use the financial aid packages given to them comes from the Higher Learning Commission (HLC). Thanks to HLC accreditation, Franklin can also accept credits that students earned from other regionally accredited colleges. 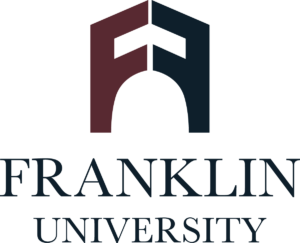 Franklin University has its own mobile app that makes it easy for undergrads to apply while on the go. They can download the app to any smartphone or tablet and fill it out while away from home. Prospective students can also use the university’s more traditional online application. Students only need to have a GED or a high school diploma to start classes. The university will accept GED scores and high school transcripts from incoming students. Those who want to transfer 24 credits or more will need to submit college transcripts too. The Franklin application takes only 20 minutes to complete, and most students will receive an answer within two business days. Graduate students applying to the Franklin University accounting program do not need to take a standardized test or submit a test score. The university looks for students who have a bachelor’s degree from a regionally accredited university and for those who maintained a grade point average of 2.75 or higher in that program. Students applying to the accounting program must take five prerequisites that include Intermediate Accounting I and II, Auditing, Managerial Accounting, and Financial Accounting. They must receive grades of C or higher in those courses. Those with a lower GPA may need to submit a standardized test score, and those who did not complete all the prerequisite classes will need to take those courses through Franklin. The cost of attending Franklin University is $526 per semester hour for undergrads. Service members receive a discount and only pay $250 per semester hour. Graduate students pay $670 per semester hour. The university also charges a per credit hour rate for students applying for an assessment or for prior learning credits. Students may need to pay an evaluation fee to transfer credits into a finance or accounting program too. All Franklin students can apply for the financial aid that they need with the FAFSA, which now lets them file at the beginning of October. This form can help students get federal aid such as a student loan and lets them see if they qualify for any university scholarships. Franklin University encourages students interested in its finance and accounting programs to apply for financial aid as soon as possible.